IBM branded (non-generic) 600GB 15K FC HDD for your IBM TotalStorage or FAStT series need. 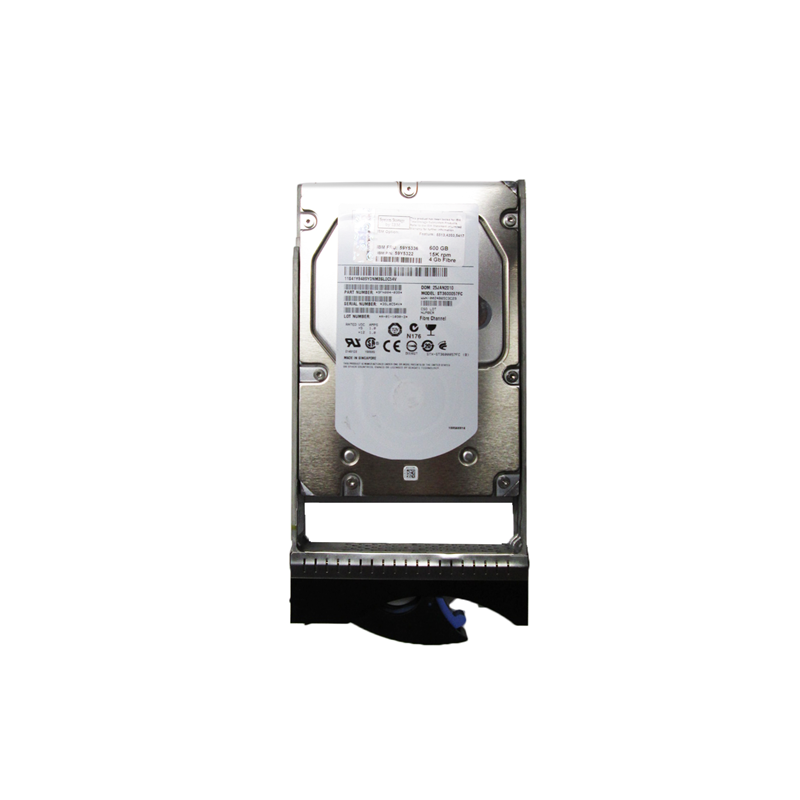 The IBM Feature Code 5417 is a 600GB 15k RPM FC hard drive for use specifically with IBM System Storage, TotalStorage, or FAStT series devices. Whether you’re upgrading your IBM enterprise storage or simply looking for a replacement hard drive, we have what you need. If you don’t see the part listed that you’re looking for, please use our Contact Us form; as we have many parts in inventory that are not listed. Please note that all IBM hard drives, systems and parts are used / refurbished, fully-tested, and backed by a 60 day warranty. The IBM 59Y5322 59Y5336 41Y8489 FC Drive is a 4Gb/sec E-DDM Fibre Channel Drive with an interface speed of 15,000 rpm and 600GB of raw capacity, used to add additional SAN storage capacity to your existing IBM DS4000, IBM FAStT series enterprise storage array, or other compatible device. An IBM 5417 FC drive will deliver high speed and high performance for your SAN enterprise storage network. The 600GB 15K rpm 4Gbps Enhanced Disk Drive Module (E-DDM) FC disk drive OPTION 59Y5460 requires an available disk drive bay in an IBM Disk System (DS Series) or IBM EXPansion Storage Unit (EXP). The 59Y5460 Enhanced Disk Drive Module (E-DDM) is a 4Gbps hot-swappable Fibre Channel (FC) Disk Drive option that requires the Link Rate Switch setting of the EXP810 expansion box to be set to 4Gbps in order to operate at 4Gbps. If the Link Rate Switch is set to 2Gbps in your configuration to accommodate 2Gbps drives that you may have, this drive will auto negotiate and run at 2Gbps to coexist with your 2Gbps components. The IBM Fibre Channel (FC) Disk Drive option increases the storage capacity of IBM TotalStorage DS4000 Series (FAStT) Storage Servers to deliver configurations greater than 32TB. This drive, when used with the fully configured, 14-bay, DS4000 Series (FAStT) Storage Expansion Units, can deliver a supporting more than 2TB of high-performance storage in 3U of rack space. The IBM fibre channel disk drive option can be used with the FAStT EXP500 Storage Expansion Unit (3560-1RU/1RX) and the FAStT200 Storage Server (3542) operating at 1Gbps FC speed, increasing the capacity of these FAStT family models as well. IBM fibre channel hard drives are provided with the speed, reliability, and functionality needed for today’s systems. All IBM Hard Drives are designed and tested for compatibility and interoperability in the systems for which they are intended in order to provide the immediate flawless integration expected from IBM storage solutions. Note: In configurations with mixed storage expansion enclosures, all storage expansion enclosures on a fibre loop must be operating at the same interface speed. Ensure that the speed of the E-DDM Customer Replaceable Unit (CRU) you are adding is supported in the storage subsystem. For example, do not install a 2 Gbps E-DDM CRU in a storage subsystem that supports only 4 Gbps E-DDMs.